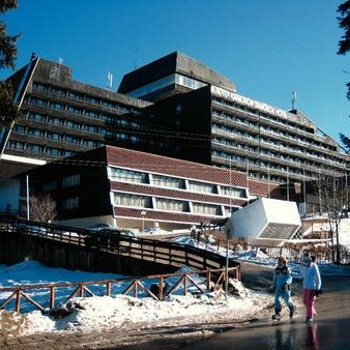 The Samokov hotel in Borovets in perfectly located in the resort, only a hundred yards or so from the main gondola lift to the Yastrabetz ski area. The rooms have TV (but only 1 english-language channel, BBC world news) a small fridge (not a minibar) a sofa bed, and a balcony. We had a great view out over the mountains. The food in the main restuarant is pretty good; at least it is hot, unlike some other Bulgarian hotels. There is always a decent variety to choose from. The hotel has its own ski school, with good quality instructors. be warned however that the downstairs ski depot room is stiflingly hot, and you will be sweltered by the time you have picked up your gear in the morning. The hotel has a large pool, which is on the cool side. The jacuzzi requires pre-booking, and you should try to book before you travel as it always seems full.